Wood structural panel sheathing maintains the structural durability of the home and allows walls to be insulated to higher R-values, resulting in high strength wall systems that are cost effective and contractor friendly. OSB and plywood structural panel sheathing provides a solid backing for these blown-in insulation systems and creates an efficient, strong wall system. Spray-in cellulose, fiberglass and mineral wool insulation can provide high R-values. Available in high R-values, spray foam is versatile and can be useful for decreasing overall home air leakage, too. 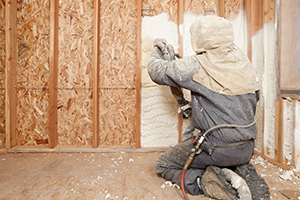 Fiberglass batt insulation is the common insulation used in new homes. R-value depends on the density and thickness of the fiberglass batt. Many levels of R-value are available. 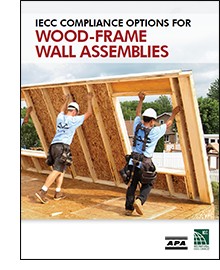 IECC Compliance Options for Wood-Frame Wall Assemblies includes several examples of wood-frame wall assemblies that comply with the R20 and R13+5 prescriptive requirements of the IECC.